These days I am on mission "clean the fridge". I bought these peppers (actually lots of these peppers) last-to-last Sunday, cleaned them, put them in a ziplock and forgot all about them until last Sunday. Like an idiot, I bought 2 varieties, Long ones and ones that were smaller. I don't know what these peppers actually are called, but we get them once in a while and the smaller ones are pickled in UP and Rajasthan (North and Western India). Anyway, the recipe - Another thing, I am incapable of giving precise measurements, because I don't cook that way, so one needs to er.. follow instinct. Take a griddle/tava, heat about a tablespoon of oil, crackle the aniseed, add the gramflour and keep roasting until a nutty smell emerges or it turns very light brown, add the salt, chilli powder, coriander powder, amchoor. Mix for another 3 mins, take off heat and cool. If the mixture is not sticky enough, add few drops of water and oil to make it into a mixture that is not wet, but rather grainy. I really should remember to take intermediate pictures, no? The stuffing should cool down completely before stuffing, my mom says because if it isnt it cooks the chillies from inside, though you do cook it afterwards, so I don't really understand why. Remove the tops of the chillies/ peppers, deseed. Stuff the peppers/ chillies with enough stuffing to loosely fill the peppers, chillies. 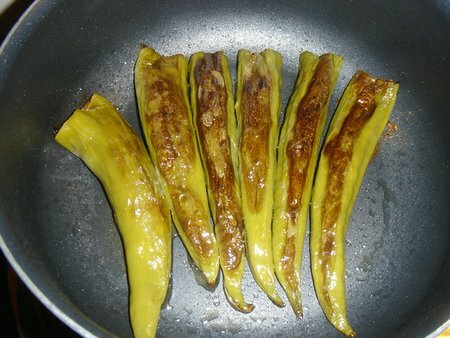 In a thick-bottomed shallow frying pan, heat some oil, arrange the peppers and lower the heat, cover and cook for 5 minutes, then turn gently and let cook for another 5 mins. When the peppers look like the pics below, they're done. I normally eat these wrapped in roti (chappati) and with yoghurt. 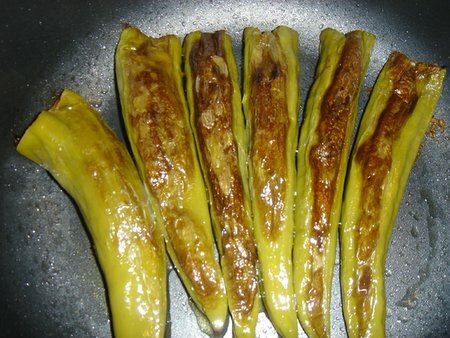 One may also have them with hot rice and dal. Or, you can have them just on their own with ginger tea. Update! I managed to remember to enter this for the Waiter, there's something in my... stuffed fruit/vegetables! event hosted by Jeanne of Cooksister, who's blog I have been reading for ages and planning to participate in the events, but would never remember to, because of my crazy schedules. 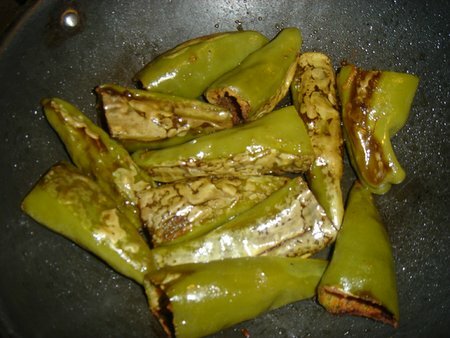 Do Potols taste any better when they are falsely dressed up and called "Green Peppers" in an attempt to heppify them ? Oooh La La. Sorry, Todd is ignoring me and thus I am acting like a true biotch. Except for the part where I am sorry in the least bit. Hi Plumpernickel & welcome to WTSIM :) Those look amazing - not at all what I expected from the title! Thanks for sharing your recipe with us and hope to see you again at future editions of WTSIM. Your peppers look a lot like the ones I've always called "hot banana" peppers. Cook's Thesaurus (www.foodsubs.com) calls them "Hungarian wax peppers". They are a light yellow green colour and not nearly as hot as cayennes.